Staying diverse has helped Gro-Moore Farms in Rush, NY stay profitable and pass down the family farm to subsequent generations. Jack and Kathy Moore, Jacks’ brother George and his wife Brenda run the circa 1917, 800-acre operation. The farm rents out 600 acres to grain growers, which provides a stable revenue stream to the Moores. The family farms the remaining 200 acres with 100 for rye, 40 for pumpkins, 15 for PYO strawberries, 42 for assorted vegetables and three for hops, a new addition to the farm. Gro-Moore grows Cascade, Nugget, Perle and Sterling hops varieties, available as fresh, dried whole leaf and pelletized. So far, growing and selling hops hasn’t been as profitable to Gro-Moore. “It’s pretty difficult to make money on it,” Jack Moore admitted. The family had been searching for a big opportunity. With the microbrewery trend in New York, it appeared hops would provide another dependable means of making money. Historically, hops were widely and successfully grown in New York until Prohibition, when the demand ceased. It made sense to try to grow them again in the Empire State, but since it’s been so long since farmers have grown hops, farms like Gro-Moore face a steep learning curve. “We’ve produced some pretty high quality hops because we’ve participated in programs through Cornell,” he said. He’s hoping to increase the yield to ramp up the farm’s profits with the crop, since the farm purchased the poles and stainless steel support wires needed to grow hops. The farm dries hops and processes them into pellets to sell to microbreweries in Rochester and Utica, NY. The farm sells its produce retail and wholesale at the farm store in Henrietta, NY. 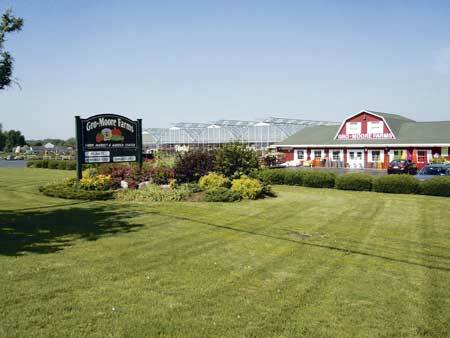 Gro-Moore employs 10 year-round and 40 seasonally between the farm and the store. Choosing Henrietta for the farm store made sense since its closer proximity to Rochester, a larger upstate city, means greater traffic. The farm operates a 60,000-sq. foot greenhouse to grow plants to sell at their retail store. Moore wants to keep up with the demand for garden plants and keep growing the varieties customers ask for, instead of gambling with varieties they may not be satisfied with. The store also sells gardening supplies and equipment, farm-grown vegetables and, from nearby fruit farms, tree fruits. Mixed containers of various greens and flowers sell well to millennials, whom Moore said aren’t as willing to dig into gardening as older generations. “A lot of these containers they can take home and put on their patio, all ready,” he said. Jack and Kathy have four children, John Jr., Jillian, Joseph and Michael. Joseph helps them manage the farm market. In addition to gardening fare and produce, the market sells gift items, baked goods, specialty foods and birdseed. George and Brenda manage the growing, greenhouses and the U-pick strawberry fields. The Moores also offer party space for rent for special events and birthday parties, and host seasonal activities to draw customers to the farm, like school tours, summer tasting events, Sweet Corn Festival, Blueberry Sunday, Peach Festival, and harvest events.